Much to Richard's joy, we have found Doha's rug shop (I think possibly availability of awesome rugs might be one his bidding criteria). We first heard of/met the Rugman (as he is fondly called) at a show he did at the Embassy. He brought a selection of rugs in. Richard spotted a war rug! He really pined for that one, I wasn't so sold on it. It was very unique with tanks and helicopters, but for in our house?!?! So when AWA had a tour at his shop, needless to say I was kind enough to sign up to get some information for Richard! 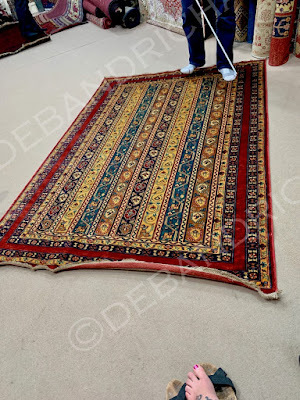 As a little background, the Rugman, or Riyaz Bhat as his family calls him, or the Indian Jones of carpets as CNN calls him has been in the rug business his whole life. His father is weaver, so he has grown up with the knowledge. 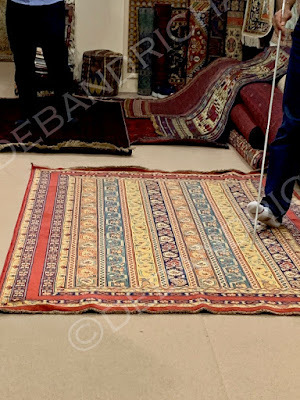 Once at his shop, he told us the history of rug making (nearly as old wine making!) 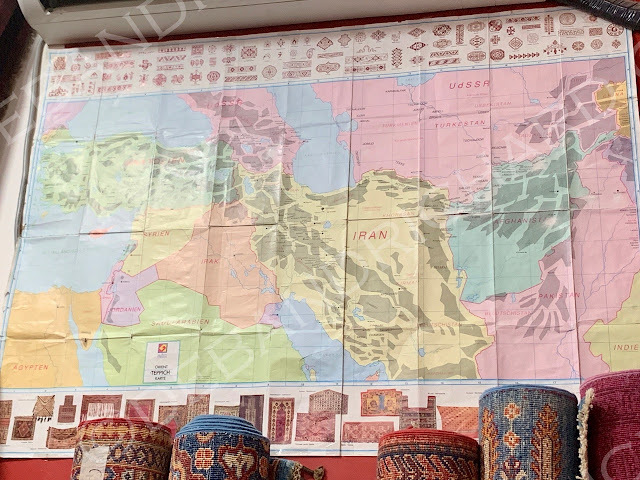 and used this handy map repeatedly to show the different areas handmade rugs are from (it is in German so some of the spellings are a bit off). 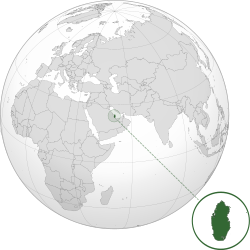 A gray patch was a historical place rugs were made, though the modern day range of tribal rug makers is a fraction of that. 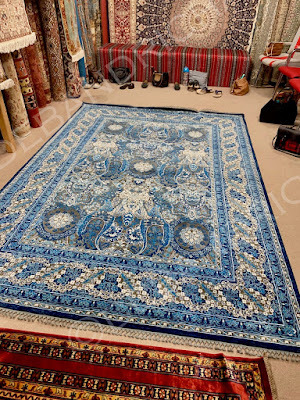 For nomadic tribes, the rugs are a necessity. The winters get cold and they are used on the floors and walls of tents to provide insulation/warmth. Throughout the winter, with no crops to be tended to, weavers of the tribe weave. A tribe of about 45 people will have about 15 weavers and they can make about 10 rugs in one winter. 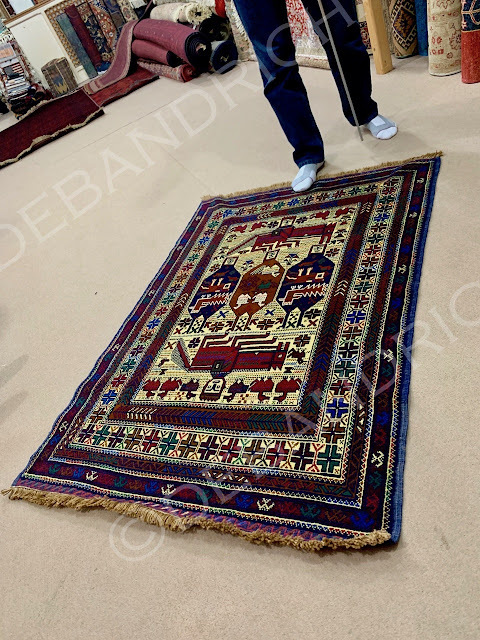 When spring comes, the new rugs will be used and the oldest rugs (likely about 10 years old) will be taken down into villages to barter for goods. That is where our rugman comes in, he goes to the remote areas, purchases these gently used rugs, has them cleaned, and then sells them. Of course, over the years, he has learned the history of the types and patterns. This is a wedding rug. 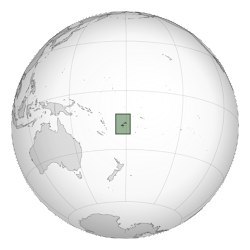 In the middle is the Uncle and two witnesses. Each uncle/witnesses will go to their respective bride/groom. Ask do you want to marry the other, they must say "Yes" three times. Then the two uncles and four witnesses all meet with the clergy. They go over the question/answer and the couple will be married. A wedding rug will be made by the Bride's Mother for the Son-in-Law. This pattern is usually half as wide and used as camel/horse back rug (so the red portion would go over the animals back and the diamond portions would hang down the sides). I really like this type pattern as it is so unique. 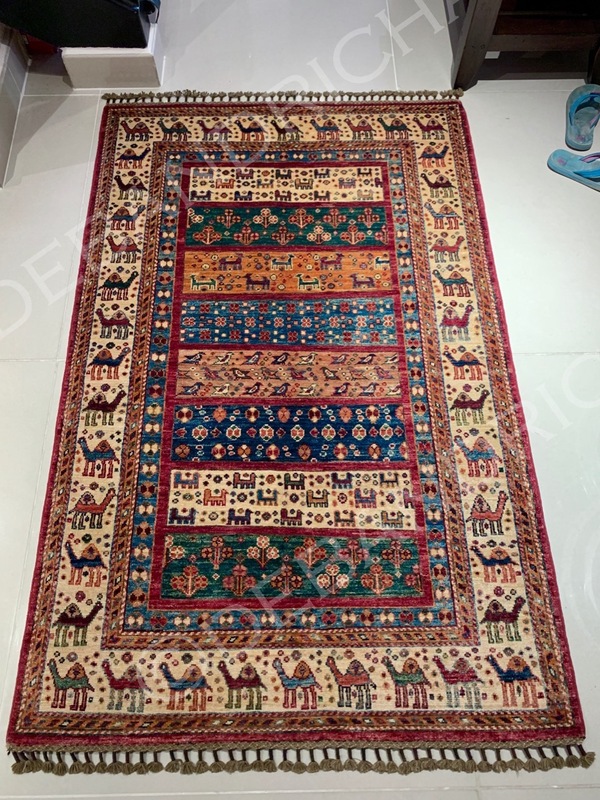 All the dyes used are natural and the weavers are so good at their craft that they can weave wool rugs so tightly that it will change colors when looked at in different directions (typically how you tell if a rug is wool or silk!!). This is the same rug from different directions! Unbelievable!! Of course, there is a little of show with every rug we saw. 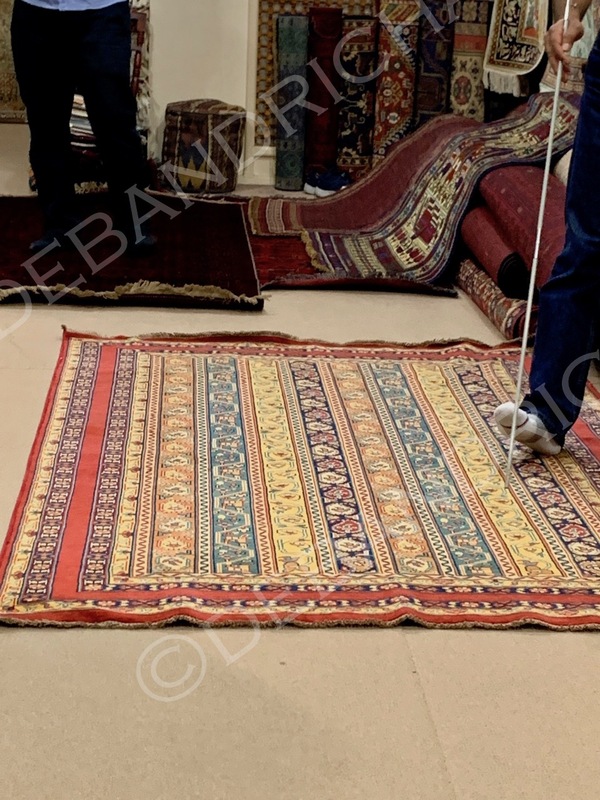 We would get a bit of backstory (possibly about the location or the materials or pattern) and then the rugman's cousin would do a rug reveal! This was another one of the wool rugs that had a color changed when looked at from different directions. He said that the bright white was rare and the weaver bleached the wool. Something that makes these rugs even more amazing, is the fact that these nomadic tribeswoman can not read or write. Yet, these patterns are soo amazing, intricate, and used 1000s of knots to make. So how can these patterns be remade or passed down then?!?! By song! The mother will teach her daughter to weave and sings the pattern (something like 2 yellow, one brown, one red, 2 yellow). Mother will weave the right side of the rug and the daughter will weave the left side and they will meet in the middle. If you find an imperfection in a rug (pattern isn't perfectly symmetrical), it will typically be on the left side meaning the daughter wasn't paying attention!! Some things are universal! To see if a daughter will be a weaver, when she's 7-9 yo she will be tasked with something like the tassels seen at the bottom of this rug. Then she must just sit and watch and clean up at the days end. If she has the ability to just sit and watch, then she will have the stamina to weave for 8+hours a day when she is older. 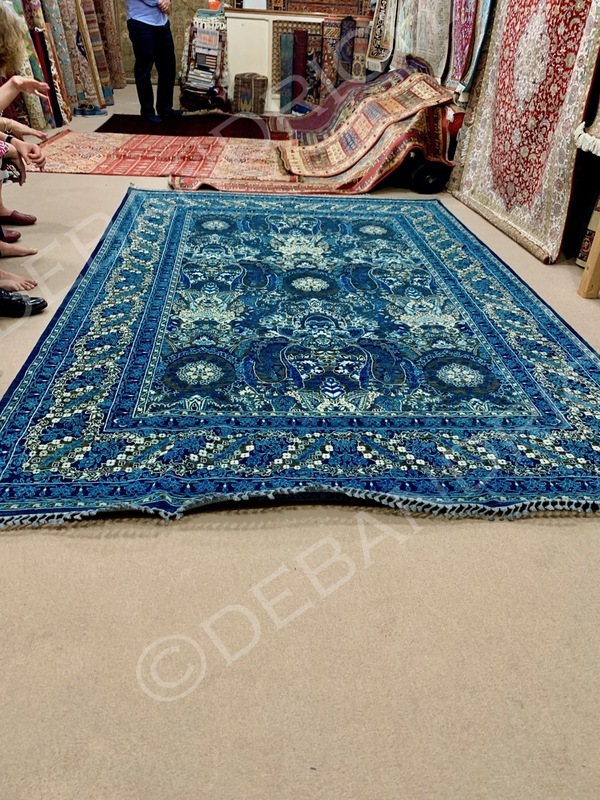 As I mentioned, the Rugman's father is a famous silk rug weaver. So, of course we got to see some of those beautiful rugs as well (those are all brand new). He showed us the short hand for a portion of a silk rug pattern. Obviously, it means nothing to me but it tells a weaver how many knots of each color to do. As with all the rugs we saw we got a backstory! He told us a story of a weaver who went to a mosque; he loved the ceiling, so he spent hours memorizing every detail. He then spent years weaving a mirror image of the what he'd seen. 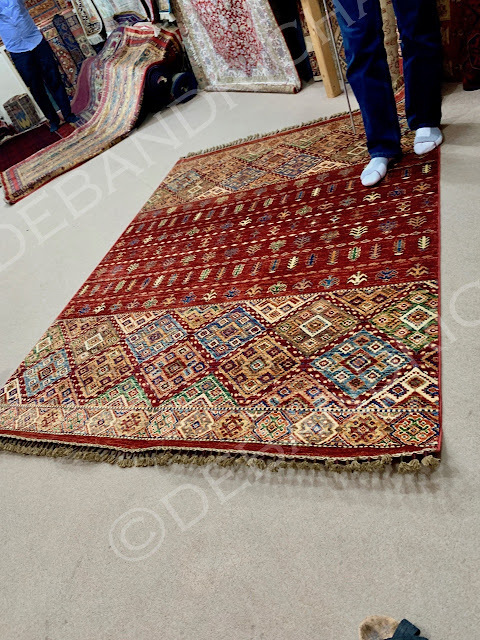 The original (Ardabil Carpet) is on display in London. The Rugman's father has replicated the pattern and we were shown a silk on silk version of it! Absolutely stunning! 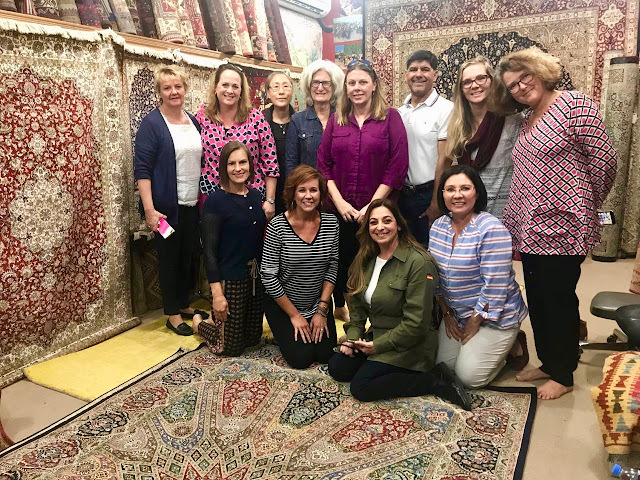 Here's the group of us AWA Ladies that enjoyed the information session amongst all the rugs. Oh.....and in case you are curious....was Richard lucky enough to get another carpet added to his collection???? Well, I have a friend that has a rug with a camel pattern. So I was on the lookout for something like that. So of course, when we were shown that one it caught my eye. 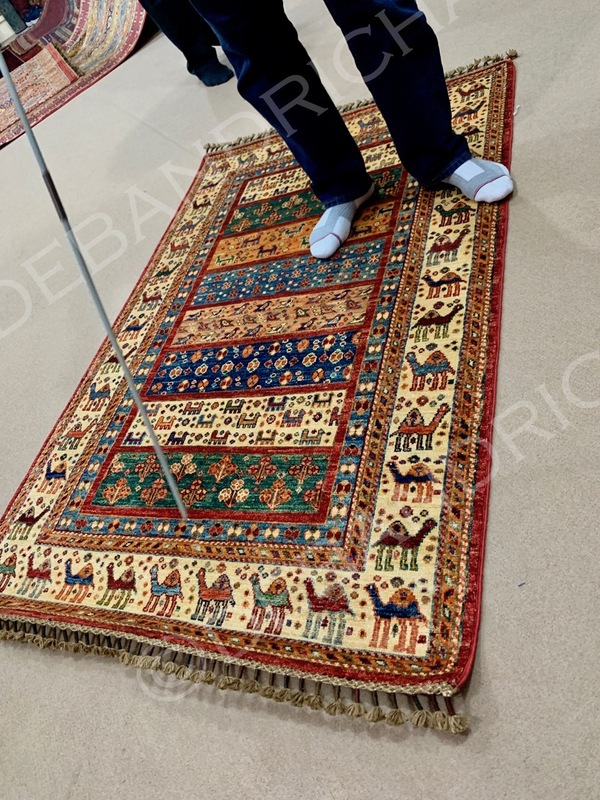 I inquired about others with a camel pattern and that was the only one they had and in fact the camel pattern is oddly quite rare. Sold! 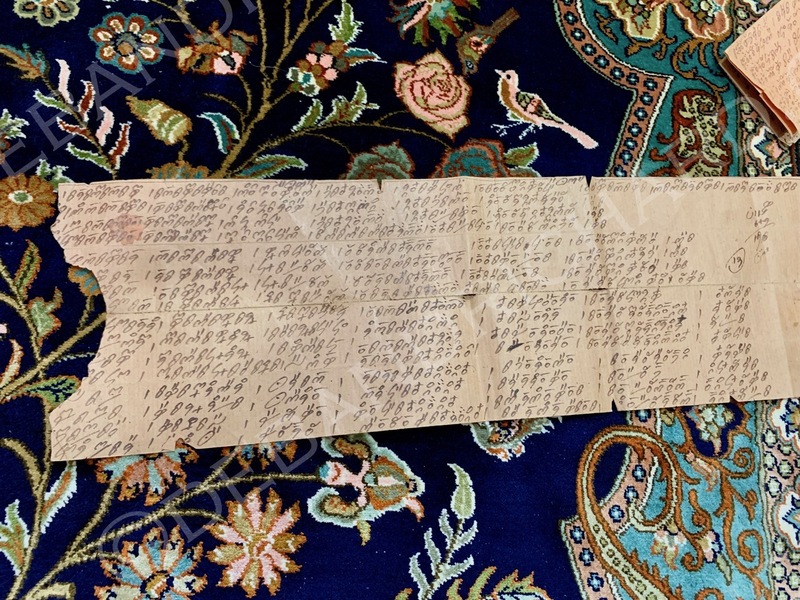 (which we received a write up about the pattern (camels, goats and roosters) and the tribe that wove our carpet...how amazing is that). Here's a picture of it in its new home...complete with someone's kicked off flip flops....lol.